I don't know if the year is ending or the new year starting, when Fuchsia excorticata flowers. I prefer to think of it as the first of the new seasons Fuchsia because it will be followed in April by F.x colensoi, and the whole process begina again. 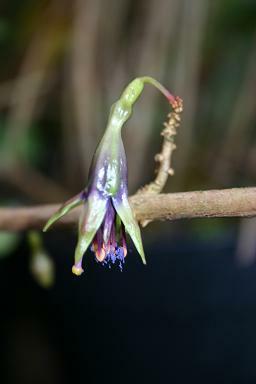 The bright blue pollen is noteworthy, a character often inherited by its hybrid offspring. It sits in the conservatory seeming to do nothing. I am very fond of it. These two statements may be connected. I would also like to sit in the conservatory seeming to do nothing. 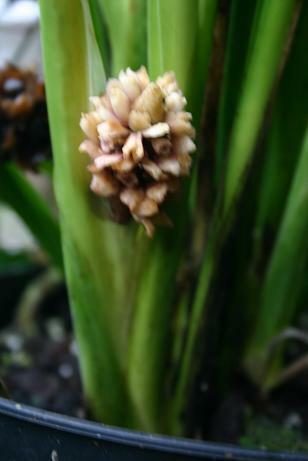 I am never convinced that it is growing but this year it has produced two flower spikes and last year there was only one. It is progress! Now I would like to persuade it to produce berries. Winter is a subtle season, the brash colourful noise of summer is behind us, and tiny delights warm the heart. Over the Chrtistmas period I have acquired this delightful little ball of moss. 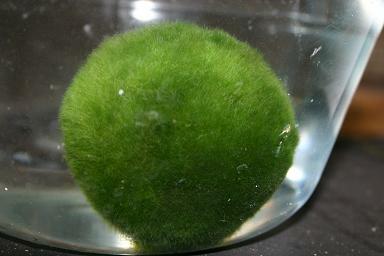 It is a Moss Ball, or more accurately, an alga ball. It grows in a lake in Japan where the gentle lapping of the waves roll it into these firm little balls. Probably reasonably hardy, I am hoping that in the short term it will forgive me for growing it in a casserole dish , while I search for something more decorous. I will manage better pictures as the season progresses, but for the moment I am too excited to overlook it here.